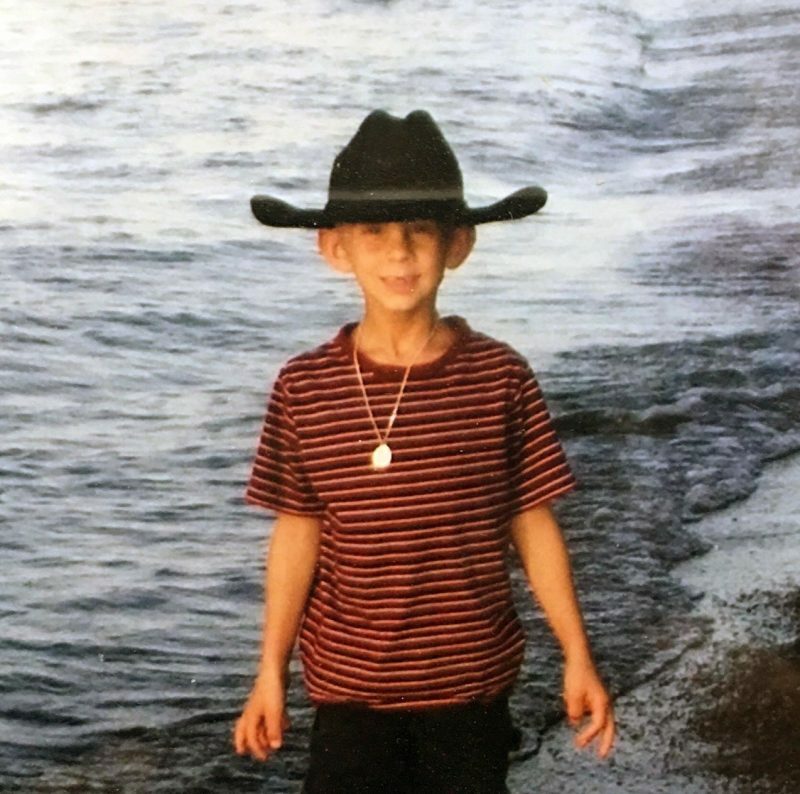 Brian Montgomery passed away from cancer in 2006 at the age of 8. After losing a child, your mind goes to all kinds of deep, dark places. In fact, there is a long period where you may not even remember going. But in coping with the darkness, your memory brings you the memories of your loved child, your son or daughter, your child… your baby. Memory is a funny thing; I believe in a way it is able to protect us from ourselves. My memory can bring me great comfort, but also great pain. 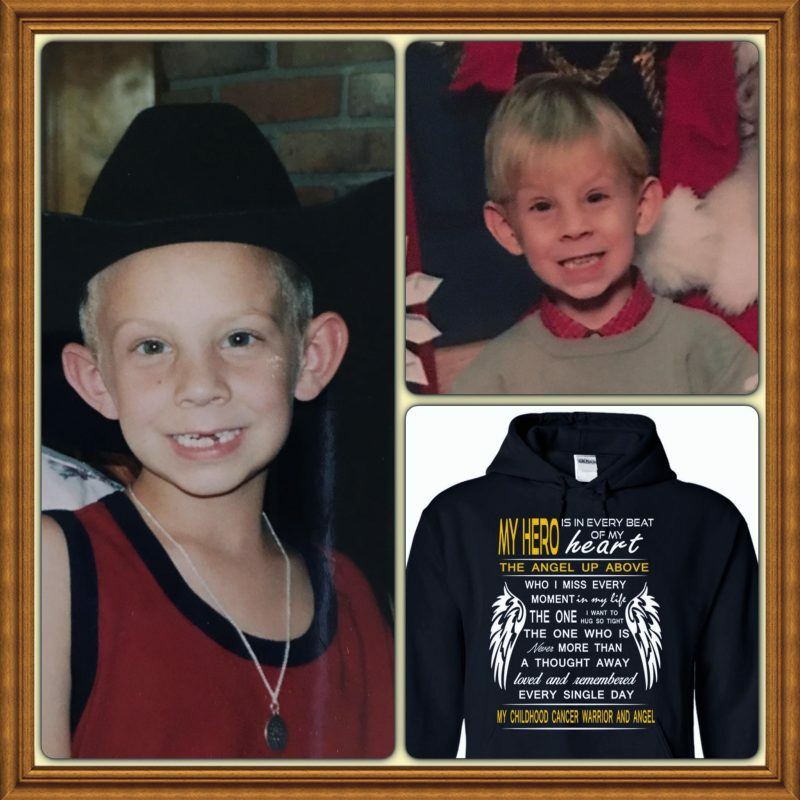 The joys of my son, the laughs, the smiles, the funny words; but then I remember the day we got the diagnosis, and the days of more bad news, and yes, the day his life ended. It breaks my heart to think that these memories are all I have left of my son, or are they? I love when my memories remember the happiest times and that is really and truly all I want to remember. I knew my son best of all. I knew everything about him. After all, he was only eight and he did not do too much without me, or did he? I want to believe that I will never forget my child. He will always be part of me. But what if others stop remembering him? I couldn’t bear it. I wonder if I did enough or am doing enough to keep his memory alive. He has been gone for over 12 years and my life has changed a lot in those years. Friendships have come and gone, family has seen loved ones die and new members come into the fold. As each one dies, I wonder if a little more of Brian dies with them. It’s not fair; he would be 21 and he would be doing great things. His dad and sisters keep his memory alive with me and for that I am eternally grateful! Allie has a beautiful butterfly tattoo with Brian’s name on her side. Her first tattoo when she was 18. How could I be upset about a tattoo that was a tribute to her brother? Good move, my daughter. Good move. I don’t know if the memories are harder because of this milestone year for my son; but this year has taught me that maybe Brian made an impact during his short life. Maybe it is because I miss him more and more as time goes on, I don’t know; but for some reason, stories of Brian have come back to me in recent years, but none more so than this year. After Brian passed in 2006, his martial arts instructor, Mr. Parker, asked if he could name the spirit award after Brian. I was so happy. Why yes, of course. 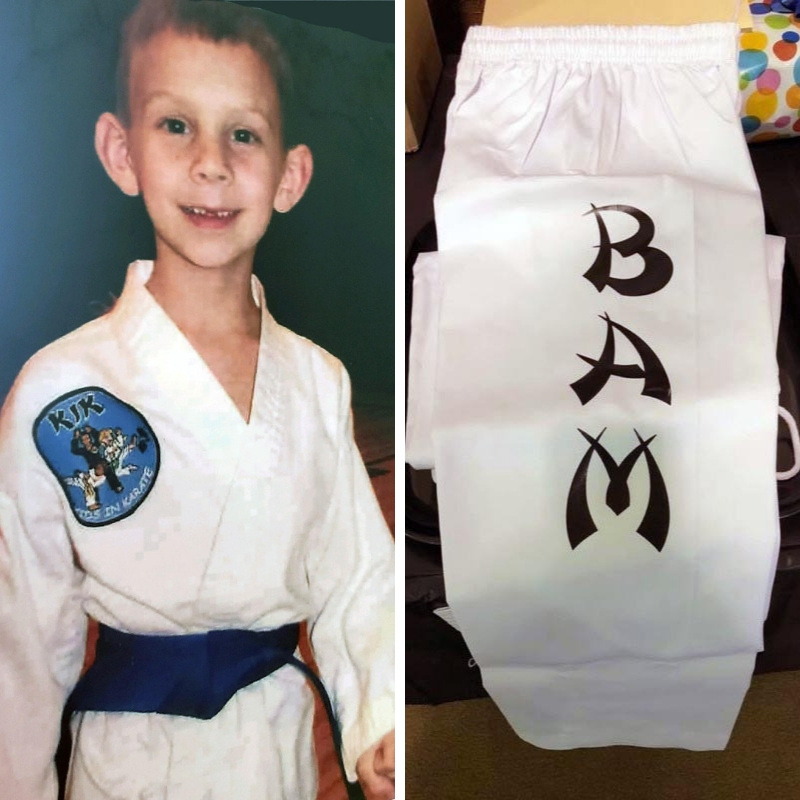 Brian loved karate and he had earned two belts while in treatment for cancer. What an honor. The Brian Montgomery Spirit Award would be given out in the fall to a deserving member of Mountain Martial Arts. I am not sure if it was the same year or soon after, but Mr. Parker also decided to rename the EAGLE team (a select team of members within the school) to the BAM team, in memory of Brian Andrew Montgomery. The BAM team is still in place today and each Fall I try to be in attendance to present the award. Mr. Parker shares with me that he carries Brian’s photo with him for every black belt test and treasures the photo. His wife shared with me a story of how the photo is kept safe and sound at home with Mr. Parker’s dobok, but for some reason, when needed most, found its way into her path. They were on a trip out of state and Mr. Parker fell and broke his neck. The chances of him ever walking again or even surviving the accident were not good. They were far from home and he was life-flighted to the nearest hospital in Pennsylvania. Jen was alone when she got into the car, but she noticed Brian’s picture on the floor. There was no explanation for why or how it would be there, only that by seeing Brian’s photo she knew that Mr. Parker’s angel was with him. Mr. Parker not only survived, but he walked again and is back to running his martial arts school. The photo has been pretty well worn and I recently gave him a new one to keep, since the first one has been through so much already. I don’t remember if it was before the accident or after, but at some point near that time, one member of the BAM team and a previous spirit award winner shared another shocker with me. She wanted me to know that she carried Brian with her everywhere as she has BAM tattooed on her ankle in memory of Brian. What an amazing tribute and gift for me as his mother. 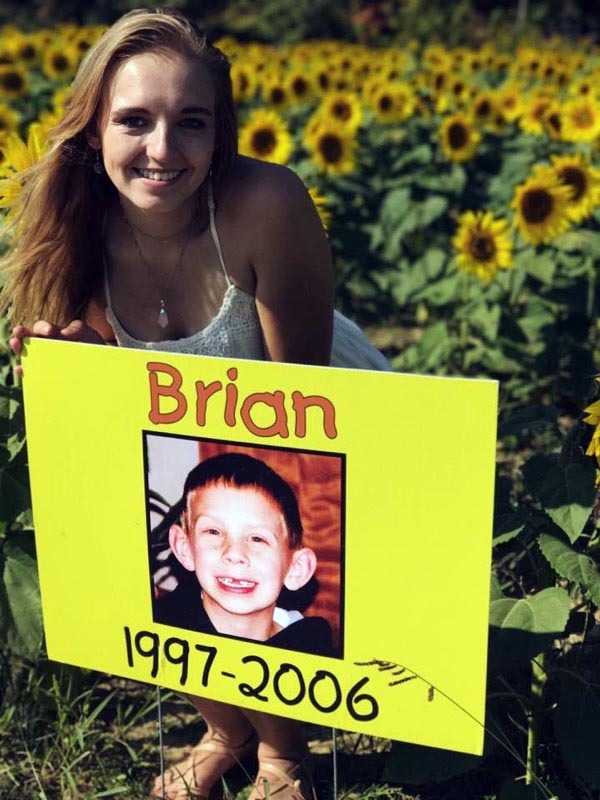 Brian was a boy she never knew while he was alive, but he has made such an impact on her personally that she wanted to keep him with her always. In August, my husband I attended the wedding of the first child raised in our neighborhood to get married. This was the first of Brian’s playmates to get married. While there, the groom’s brother came up to my husband and me and told us a story. He and Brian were very good friends and playmates, as all the kids were. It was a tight-knit group of kids. They were literally with Brian until the night he died, playing Nintendo games and cracking jokes by his bedside. Brendan told us about how when Brian was sick, he gave him a purple rubber bracelet with the word “hope” on it. Brian loved his bracelets, and I didn’t realize he had shared one. Brendan said he wore that bracelet for years and years. Brendan was about 10 when Brian died, so he too was a young child. At some point the bracelet broke and he began carrying the broken bracelet in his pocket, keeping Brian with him at all times. Brendan went on to join the Navy and is now stationed in Texas. He was home on leave for the wedding. He told us how he lost the bracelet one day and was devastated. It was then he decided to carry Brian forever with him by getting a tattoo across his wrist of the word “hope.” Now he would never again lose the bracelet from his friend. During this month, my daughter took a drive up to the sunflower fields in Avon. To her amazement, as she walked up, there was her brother’s picture! It took her breath away. How thankful we are that he was remembered by the Prayers from Maria Foundation and made a part of the field. Brian was only here 8 years and 9 months, yet almost 13 years after he passed, his stories are still reaching me. I thank God every day for my little boy and for my angel. Energized Toward Healing Bereaved Parent Series, Feb. 14-April 11: We invite parents who have lost a child to participate in our parent grief support series. Our hope is that the information and support from other parents will help to energize you toward healing. We know that every parent’s experience with grief is different, but we want to offer sources of experience and empathy to help along the way. Good Mourning Grief Support Series for Children, Feb. 12-March 12: This series is designed to help children and their parents understand and deal with feelings of grief resulting from the death of a loved one. Support groups are divided into separate groupings for ages 5 to 8, ages 9 to 12, and teenagers. Parents/caregivers also can partake in adult support groups while their children meet in groups.